Multiple To-Do Lists that can be sorted by the priority/importance of the tasks in the list. The to-do items can be organized into categories, arranged in a hierarchical way. This makes it easy to maintain both business and personal items in the list, or handle many different projects, while keeping them separate from each other. A pair of Diary/Journal areas that can be used to keep long and detailed notes and diary entries. The project description area allows a multi-paragraph description or status to be typed in. 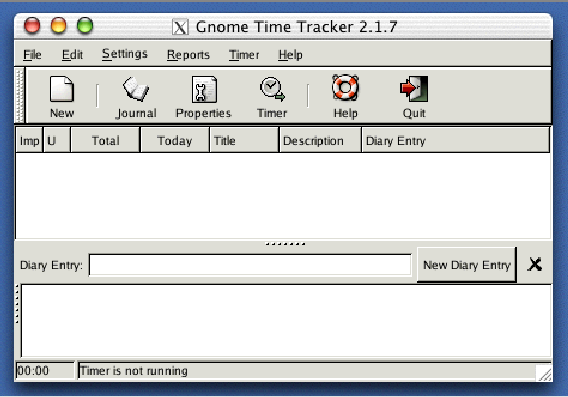 The diary area allows day-to-day notes to be associated with a set of timestamps, so that one has a record of what one did on any given day. A Running Timer, with time totals, for each project/task. One starts the timer by clicking on a task: it will measure the amount of time that you are in front of the computer. If it detects that the keyboard/mouse are idle, it will stop the clock. If the clock stays stopped too long, it will nag you to start it up again. You can view time totals by day, week, month or year. A Billing Status dialog for each diary entry. You can mark any given diary entry as bill-able/non-bill-able, paid or pending, and set the billing rate. Each project can also be marked up with a set of project-planning information: planed start, end and due dates, hours to finish, percent-complete. This is in addition to assigning an urgency/importance to each project, as well as a status (completed/in-progress not-started/canceled). A half-dozen different HTML Reports that can slice and dice your lists. There's a Journal report that shows all of the diary entries for one given project. There's an Invoice report that summarizes the time spent on each entry, and computes a dollar amount for it. There's a Status Report that prints the title of each project, together with the paragraph-long descriptions of each. There's a ToDo report, which prints only the project title, the importance/urgency, and the completed/in-progress/not-started status. The Daily report summarizes the total time spent on a day-by-day basis, and lists each of the projects that were worked on in a given day. Each of these reports can be customized. And, because they're HTML, you can even publish them as web pages. (Yes, I've thought of using GnoTime as a weblog management/publishing tool). We'd like to tell you a bit more about some of the features. But first, we want to tell you that GnoTime is Free Software, distributed under the GPL License, for the Linux, Mac OSX and other Unix desktops. No, it does *not* for MS Windows. Sorry. We've worked to try to make the GUI as simple as we can, and we're not done yet. GnoTime will auto-save data, so that you don't have to. (It also means no data loss if something crashes). The hierarchical tree of projects is managed through drag-n-drop, and can be navigated from the keyboard, with arrows keys and carriage returns. The left/right arrow keys expand/collapse project lists. Hitting return starts and stops the timer. We also try to unclutter a mess of timer stops/starts by trying to clean up time-keeping cruft. Extremely short time intervals are automatically removed from the logs (the length is configurable). Slightly longer but still short intervals are auto-merged into nearby neighbors. Short gaps between intervals are coalesced as well. You can specify a time period of 0 seconds to turn these features off. The journal/report GUI is based on template HTML pages. If you know HTML, then you can create customized report pages. Particularly handy for slapping the company logo and mailing address on the top of the page, and generating a unique, custom look. User-defined reports (contained in ghtml files) can be added to the menus by typing in the filename into the 'New Report' GUI dialog. Admittedly, hacking on HTML templates is not the easiest thing in the world: you can't (yet) customize reports with a WYSIWYG editor (although we are contemplating one). But we figure that HTML can't be that hard: the nerd in you will not be intimidated. It might be a bit scary to mention scheme at this point, but lets just say that you can be totally ignorant of scheme and still be able to do some pretty fancy customization, above and beyond what HTML lets you do, by hacking on the scheme in the report templates. Fresh in version 2.1.9 is the ability to embed simple SQL queries in the report templates. We know that many of you power users know SQL, so we figure you'll like this. The SQL gives you the ability to query for only those projects/tasks that meet a certain criteria, which is handy if you've got years worth of data and years worth of project lists and to-do items, and you want to just fish out the ones from last month. Disclaimer: we're still working on SQL support. It works, but you can't yet query everything. A shell command can be executed whenever a project timer is started or stopped. The project title, description and other parameters can be passed to the shell command. We don't know what the hell you power users do with this feature; its been in GTT since the very earliest releases. All project and journal data are stored in an XML file format. The XML file accurately reflects the internal state of the GnoTime data, and therefore generic XML tools should be able to perform interesting transformations on this data. The GnoTime menus and messages have been translated to dozens of languages. There are message catalogs for the following locales: az bg ca cs da de el en_GB es et eu fi fr ga gl hu it ja ko lt lv ms nl nn no pl pt pt_BR ro ru sk sl sv ta tr uk vi wa zh_CN zh_TW Some of these translations need an update; they're quite old and out of date. We need help here. Translations are needed for the manual. Actually, the manual needs a complete re-write; its three years old, and doesn't discuss most of the newer features. Below are a couple of screenshots from the current Gnome2 version of GnoTime. The screenshots pages shows more. The same main window screen, but with additional columns enabled to show project status. Note the new notes-taking area at the bottom of the screen. Well, sort-of. Here's a screenshot of a port under Macintosh OSX Fink; unfortunately, this port was never finished/published. Your favorite distribution (Debian, RedHat/Fedora, SUSE, Fink) already includes pre-compiled binaries of GnoTime, and you should probably be searching those out, and installing and working with those. That way, you at least have some guarantee that its been tested and is known to work with your system. If you are adventurous, and know how to compile from source, and absolutely must have the latest and greatest version, then visit http://sourceforge.net/projects/gttr/ to get the source-code tarballs, instructions for CVS access, etc. If you found a bug, please rest assured that we will not fix it unless you report it (and even then, it may take us a while). To report a bug, please visit the SourceForge project site, and follow the links. The same remarks apply for feature requests and patches. The best place to submit a patch is to sourceforge. That way, we won't loose track of it. If you have questions, want to make comments, or engage in general discussions, you can subscribe to the mailing list, or you can post to the discussion bulletin-board. You can get to either through the SourceForge project page. We need your help to make GnoTime better. It sure would be nice to have a fancier web site for this project, maybe some nice graphics. Can you help? The latest releases continues to focus on usability and convenience features, making GnoTime easier to use and thus more powerful. Crashes when 'help' button clicked in certain dialogs. Corruption of 'reports' menu, followed by crash. Fix flyover help to actually work. Add missing 'copy' to interval edit popup menu. This release fixes a number of bugs in earlier releases. Fix Help system so that help actually starts up. Fix old, multiple scheme bugs affecting billing reports. Provides 'infinite undo' for cut projects. Keyboard cut (ctrl-x) fixed so that it cuts only if project window has focus. Can now specify day-of-week for the start of a new week. Also, end-of-day need not be midnight - its now configurable. Fix order of yesterday/today columns. New whiz-bang SQL for reports. This release adds support for simple report queries. In particular, reports can now be generated for all tasks that occurred between a pair of dates; an extremely general query system is now in place, although it is not used except to perform this simple date query. Toshio Kuratomi provided a major cleanup of the documentation subsystem. Goedson Teixeira Paixao provided a new pt_BR translation. A variety of minor bugs were fixed, including a crash of the 'yelp' help browser. Version 2.1.7 fixes some internationalization bugs, and ports the configuration system to GConf2. The 'custom reports' menu is now editable. The "Daily Report" will show not only the total hours worked, day by day, but will also show a bulleted list of tasks worked that day. The main window display can now show total hours worked for previous day and previous week. Sub-projects can now be fetched via scheme, allowing them to be included in reports. The scheme subsystem now includes an elementary type system, allowing more complex structures to be built. A half-dozen different crashes have been fixed. The main window has been reformulated in a big way: It now includes sub-panels for editing project and diary notes. This 'notes area' makes it far more convenient to make extensive notes and 'blog' your way through a set of projects. Also fixes bugs with backup timestamps, also with cut-n-paste of project trees. The scheme interface re-design has been finished. This means that the HTML reports are far, far more configurable, and can be made to look much prettier. The old, nasty table-formatting features have been removed. It also means that tab-delimited export now works cleanly, and other export formats can be easily added. Click here for older news items. GnoTime is currently written mostly in C and a little bit of Scheme. C is used to implement all of the core functions, whereas Scheme is used to generate the HTML reports. The Scheme/HTML combo was chosen in order to make it easy to customize reports, while allowing the result to be easily viewed in a browser, sent by email, etc. The GUI system is all in Gnome, using the Glade interface designer. The file format is in XML, following current trends. There are some interesting directions one could play with. For example, rather than creating reports with embedded Scheme, one could try to use GnoTime's XML data format as a mirror of its internal state, and then use DOM to extract various parts out of it, and thus build reports that way. Gournal, Note-taking tablet application. A paper-like interface allows you to hand-write notes. This is a gnome app (actually, gtk2/perl). Jarnal, a Java-based note-taking tablet app. QBall's GToDo is a simple Gnome2 to-do list application. Quozl's GFocusTimer tracks which windows your mouse is in. GTimer, an older gtk-1.2 timer application. KArm is a simple KDE/Qt-based time-tracker. See also this website. PTT another KDE-based time tracker. 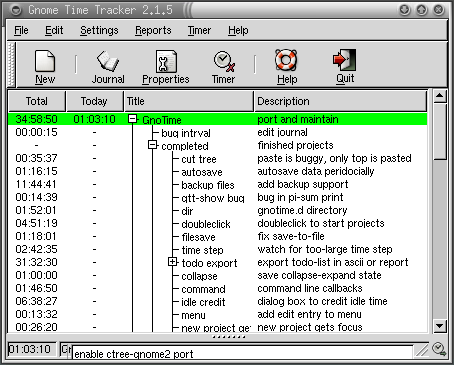 Titrax is a very old (early/mid 90's) X-Windows time tracking tool. This is a nice historical snapshot providing a glimpse of the way things used to be in the Unix world back then. LinuxLinks provides a huge list of Linux timer software. Journyx, an up-scale, commercial web-based time tracking and billing tool. In memory of the World Trade Center bombing, which occurred while the first major revision of gtt was being written.